14 Hours of advanced professional ‘inner-game’ sales development. Our online self-coaching learning system builds your people’s motivation, resilience, ability to deal with pressure and as a result, sales performance. It is fully interactive, has over 40 videos, lots of quizzes and activities and integrates fully into normal work activities. The learning content is equivalent to two days training. Managers can utilise the system as a resource for coaching and mentoring their teams, using proven techniques. Distance learning: 14 hours of engaging and interactive professional sales development. 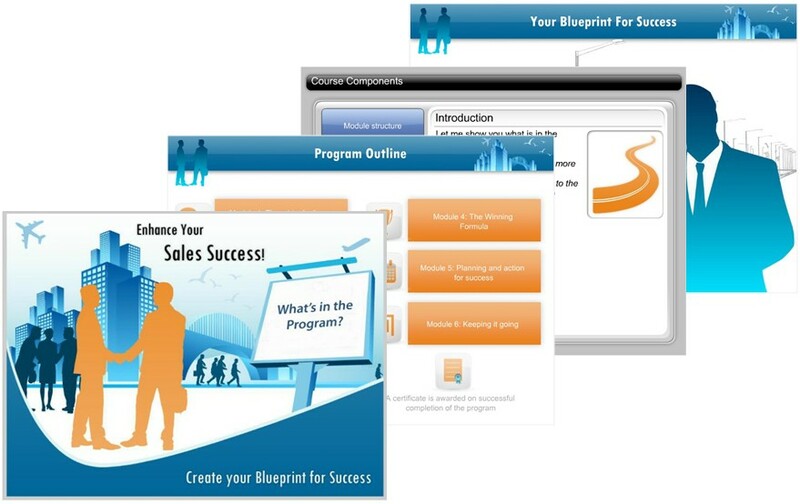 Includes Sales Blueprint for Success Workbook. This evidence based program will equip your salespeople with the knowledge and techniques to be able to develop and sustain their motivation, resilience and ability to cope with pressure of daily sales activities. The programme utilises proven psychological methods and insights together with cognitive behavioural coaching techniques. These techniques are applied to real world sales situations, through engaging, activity based, interval learning and is available 24/7 on a worldwide basis. A Certification of Completion is awarded on programme completion. The programme is for anyone who is involved in any type of sales activities, whether it is their full time role or just a small part of what they do. It will help anyone who sells achieve greater success, no matter how successful they are today.